Towards the end of Desert Riders in 2003, Jon and I met Rainer Bracht and his party in Tam (right), a couple of weeks before they were all abducted off the Graveyard Piste (Route A2 in the book) along with 27 other tourists. Part of ‘Group II who did the full six months and ended up in far northern Mali, he co-wrote 177 Tage Angst (left) with his wife Petra. I considered having their book translated at the time, but in 2004 was told by my German reader (a bike rider but not a Saharan) that is wasn’t so good. Or just follow it below. There’s a gallery at the bottom of the page. 177 days of the Sahara driver Rainer Bracht was with 31 other hostages in the hands of Algerian terrorists. At home, his wife Petra experienced during its one of the most spectacular search and rescue operations in postwar history. In a multi-part documentary MOTORCYCLE now published the records of the two. What happens when a motorcycle vacation for inferno? In the second diary part of the 177 days’ duration abduction by the mujahedin Rainer Bracht depicts the liberation of the hostages and the first subsequent grueling run through the Algerian desert. Meanwhile, his wife Petra followed the increasingly complex rescue attempts by the German government. And both try to survive the months of anxiety and waiting. He in Algeria, they in Detmold. In the last diary of the nearly six-month kidnapping by Algerian terrorists Rainer Bracht portrays the grueling escape through Mali. Petra Bracht persecuted under which the struggle of the German Government to a breakthrough in the negotiations. As on 17th August finally the saving “You are free,” sparks through the airwaves, it can no longer really believe. Rainer: Finally we have crossed the border to Mali and may a few days to rest near a fountain. For weeks we have been in the now red-hot South Algeria with our kidnappers on the run. At the well succeeds Sascha, unnoticed to make a Tuaregs attention to our situation. In fact, the message a little later reached the mayor of Tessalit. There comes a radio message that we should contact you. But not as hoped by the German authorities, but the mayor of Illizi in Algeria. The kidnappers are now back on his feet! Way immediately! The limit is still too close to prevent access to the Algerian army. Petra: On 29 7 03, the 158 Day at 20.30 clock calls to the police. I would have the opportunity to write a letter Rainer. In half an hour they would fax it to Berlin. In my mind, chaos breaks out – there’s so much to ask and tell. And now find the right words in a hurry …. Actually ringing half an hour later a police officer to pick up the letter. Shortly after, it occurs to me that I have not even thought about kissing mitzuschicken! Rainer: A grueling long-distance journeys further phase begins. Up to 36 hours we will be shaken up in the SUV without a break. After a few days we arrive exhausted a dry river bed, where we stayed for some time. Fighters of 9 Rebel Division are with us for a while. You should support the action because they know here and allegedly have connections in Mali. Eventually a young Tuaregs marched boldly with his camel through our warehouse. Only when he has all greeted with a handshake, discover the Mudjas him and send him away. Petra: Only a day later he receives a letter from Rainer. It is overwhelming! Amazingly, he is exactly the questions that I have answered yesterday. I call on parents and siblings and I read each and every one before the letter. Our parents come immediately want to see the list with your own eyes. He reassures her, even if he spent five weeks old ist.Rainer: The kidnappers turn again a video. First a group shot, then everyone should greet his family. In a written statement, they explain that Michaela Spitzer’s death was a tragic accident bedauerter by themselves and we were well treated. We must all sign. We fervently hope that Michaela’s death was at least the sense to clarify the seriousness of our situation. As the kidnappers set we now all hopes for the Malian government. It is regarded as cooperative as the Algerian and could finally get things moving. Even I am cautiously optimistic. The next day, the emir (commander) breaks up with a squad to negotiate. Our fellow Christian Green take them with you. He and his girlfriend in Berlin fluent in French, so that the Mudjas hope to establish direct contact with the German government. Petra: On 31 7 03 announces the police a video of the hijackers. I am extremely anxious and drum up the rest of the family together. Nobody knows what to expect. How will they look like? I’m afraid. By 18 clock are all there. Also the police. We can not imagine the band would leaked to the media. It was eleven days old, all the hostages are to see it, and everyone says a short sentence. »Rainer Bracht, Allemagne, many greetings to the family and to Petra,” Then said Christian, that they needed medication, the extreme heat and the food supply are problematic and they mourn Michaela Spitzer’s death. And hoped for a speedy end. You see relatively good, are neatly dressed and not emaciated. But tired and annoyed. When the family is away, I am a completely hedgehogs, need rest, absolutely. My thoughts are with Rainer. Rainer: is brought to Bamako Even during the film to the German Embassy, we set off. 36 hours non-stop, it goes in the northwest Mali. A total of 600 miles. For the first time it starts to rain and we have water in abundance can swim and even do laundry. Petra: On Friday, the first 8 03, an interview with me, which I have never been displayed in the “world.” I think you can not sink deeper in journalism. Over the weekend I try to find my energy and patience again. I succeed, but there is also no other way. Hopefully Rainer and the others have not yet lost their. In Heiligenkirchen a memorial service for the hostages will be held, and a lady of a sect called already for the third time. You have written poems and wanted to help with the proceeds of the hostages … In the evening, the PC crashes. Diagnosis: disk is destroyed and all data gone. So start from scratch and re-enter everything. On Tuesday, the computer has made so far that you can work on it. My navel to the world. A day after another goes by, and I fall into a depression for a week, want to talk to anyone because I just constantly erupting into tears. Feel empty, tired and beaten. I mobilize all forces to get out of the hole. The only one who could comfort me, sits in Mali. Rainer: After two weeks of popping a few faithful of the Emir on again. Together with the SUV of the Malian government. Now what really seems to move. We are almost euphoric. They not only medicines and bottled mineral water, but letters from home! Petra! She answered my questions. How they survived the operation, which make the family and especially my ailing grandmother, as my pay comes without ends meet and so on. Only much later did I learn that at that time they had not even my letter. They just knew what would move me. I’m happy how close we stehen.Petra: On 9 8 03 held another meeting at the Foreign Office. Since I am handicapped by the operation, it sent me home a summary of the conversation. This finally the persistent rumor is denied, some hostages were sick. Only sciatic pain from a few hard chairs seem to plague, otherwise all are ok. Furthermore, Christian Green has apparently made telephone contact between the kidnappers and the German government, and the negotiations that have been conducted, a Tuareg leader named Iyad Ag Agaly, now governs the governor of Gao. A military action may not be remembered in Mali in order not to endanger the life of the 14th I sometimes think that Rainer and this fate will never leave me. Rainer: The Islamists are now as excited as we constantly have the radio on the ear, so not to miss a message. Partial several times daily sparked with the Emir. However, I am now experiencing the only threatening the entire hostage situation that emanated from the kidnappers themselves: When we want to look during the rain in one of the SUVs protection as agreed, trying to stop us because a fighter. Angrily, I reminded him of our agreement, which he in turn uses a Kalashnikov furiously and loaded by in front of me. Fortunately, his colleagues overwhelm him in time. What had happened? Amazingly, they believe my statement and apologize for their quick-tempered buddy. Why I was not afraid? With a joke I Wiegele the thing ab.Petra: State Chrobog flies on 12 8 03 to Algiers and then on to Malian President Amadou Toumani Toure in Bamako. The talks take hours, but then Chrobog expressed very optimistic. It will not be long. A few weeks, maybe even days. I hangele me from one branch to another. Chrobog send a postcard with the image of a rusty padlock. Feel the need to thank him. Rainer: After two weeks, we set off again, roaring back in a southwesterly direction. Something seems to have changed, because the kidnappers not to hide, but to use for the first time normal slopes. However, they continue until a fatigued driver overlooks a wave and the car almost rolls over. Only then slept. And then repaired the Toyota. Mostly it would go faster if they drive a little slower, but that contrary to Arab mindset. Petra: The 175 Day I suddenly feel that something is happening. And my feeling has always been the most reliable indicator. I know Chrobog get the thing out. How difficult the negotiations must be, can be only guessed. In Algeria, the government could be dissuaded with difficulty by a second military operation. Then – as should all arrive intact to Mali? And there will be rebuilt trust between kidnappers and negotiating partners? As a transfer can take place without the kidnappers fear of being shot immediately? The Algerian military had reluctantly an escape corridor for terrorists held open – but they are still on the Mali border on the lookout. I’m afraid that in the end even use weapons is commanded. But I was assured that just should not happen … Rainer: We stock at an agreed meeting point, wait for the Emir. It is the same place where we had parted from him two weeks ago. A good sign. I just bring in the Mudjas to eat, sounds as motor noise. They immediately jump into their battle vests and shoot into the air. Intended for professional reception Emir Abd El Razak, who returns with his negotiating team. Personally, he appears to us prisoners, and solemnly declares that everything is regulated, we would be free! Petra: On Saturday evening, 16 8 03, a journalist friend informs me that the release was at hand, probably in the night from Sunday to Monday. It would be nice, but for me, it’s just THE call. The police asked me to now be available continuously. I can feel it tingle formally. Then it happens, on 17 8 03 calls to the CID at 22.37 clock – they are free! Berlin just have it officially confirmed. I weep with happiness. Rainer: We have to pack up and merged a few miles away with a group of Malian military and Tuareg. Including Ag Agaly, a legendary leader of the Tuareg rebellion in the early nineties. They had taken over the role of mediator, and to them we are now passing. It’s really over. Most fundamentalists say goodbye with Arab courtesy and friendly pats on the back from us, invite us even like to come back to Algeria, nothing would happen to us. However, other travelers threaten our fate, they emphasize the same time. Express, the driver with lenses like glass blocks, thinking about my health and forcefully admonished me not to smoke and to avoid pork and alcohol in the future. I promise to do my best, but suspect that I will not succeed. Recently, the Emir still want my email address to let them know, if they had recovered my BMW, if the Algerian military to take care not drum. The situation is grotesque. I’m not even angry them – they probably do not even know what they did to us haben.Petra: at 22.45 clock, it comes in the news. I stare numbly at the screen where Chrobogs is to see happy face in front of the cameras – he has really come, the moment. After 177 days and nights. I just celebrate a little with Andrew and Steffi from our house, as once again the phone is ringing at midnight. Who is calling now for? “Hello,” “Hello, it’s me, Rainer” In my mind there is complete emptiness? “Rainer, which Rainer” “Yes, Rainer, your husband,” Then I break into tears, immediately followed by croaking connection together!. He was, THE call. And I do not even know Rainer vote! Incredible! When he calls shortly afterwards a second time, I am aggregated. He says that he’s fine, if they had just eaten and went to sleep right now. For some reason, I wonder if he still had his sleeping bag. No, long gone. They slept so in the sand. Out of sheer noise I understand very little, but it’s overwhelming. Rainer: With the onset of darkness, we set off on our last trip. Around midnight stop the Tuaregs at a water point with dry wood to make tea. By satellite phone we can call home. Petra’s turn, but stunned, probably did not expect me. But it is wonderful to hear them. Petra: A little later, the first journalist to dive in front of the house, there’s no dodging, “How do you feel, how’s your man, you already had contact” day they assail Steffi in going for shopping right at the seventh?. She takes with Andreas incessantly bimmelnde the phone that can not be stopped because of possible further calls by Rainer. The next morning, the aircraft is expected to arrive in Cologne. Two CID officers want to go with me. I am pleased when I hear who it is: it all started with these two, they had made contact with me and helped more than once, to prevent the worst. Rainer: At dawn we set off, to Gao is 500 kilometers to go. Lunch will be served up in a village tea, milk and cookies, then it goes on as soon as possible. At dusk we reach the city and a little later the governor’s palace. After several speeches, during which I yearn mainly after a beer, it goes on by plane to the president in the capital, Bamako. He was instrumental in our release, as I hear from people mitfliegenden by the Foreign Office in Berlin. They tell me of Petra, what great job they made in Germany, how much optimism and replaced it had spread. Petra! Thankfully, I lean back. My worry about them falling off with talents seriousness, I am happy and a little proud. She seems to have moved a lot for us. Petra: With a pocket full of clothes, pipes, gummy bears, chocolate and the shoes that I had bought a few weeks ago, we set off at dawn to the airport. When we arrive, there is still enough time, and I watch the window, as the machine from Bamako lands. Now there are no search images on TV, now it’s reality. The moment when Rainer comes through the door, finally overwhelmed me. Very narrow and deep brown, he has become, has trained as a marathon runner. A mattress and a bag he still has one left not left of his possessions. Therein some clothes that never belonged to him, two stones from the desert, half a bangle and a small fossilized spine … When I take him in the arm, I still smell the dust and the dry air of the Sahara. “Finally,” I do not bring out more. I will never forget is his happy laughter at this moment. It is vorbei.Rainer: Now it’s finally back home to Germany. Of sleep is not to think of many conversations the night passes literally flew by. Suddenly a final conflict among us surges 14 – one of the Swiss do not want to pass on to the police, the coordinates of Michaela’s grave. Only needs to be discussed in the group what to do with it. My God! I am infinitely glad that it is over. But before I can really upset me, I discover Petra. And everything else faded to nothingness. I have arrived. It is my great desire to thank all the people and agencies whose work ultimately led to our rescue. I’m overwhelmed solidarity and support that Petra has received from the Sahara Club, the company Därr and countless private individuals members. If I had all of this would be even suspected, I liked my odyssey easier. Is difficult to accept, however, that local agencies and tour guides, months before the kidnapping of “peculiar people” did to the graves runway, but did not pass on the information. 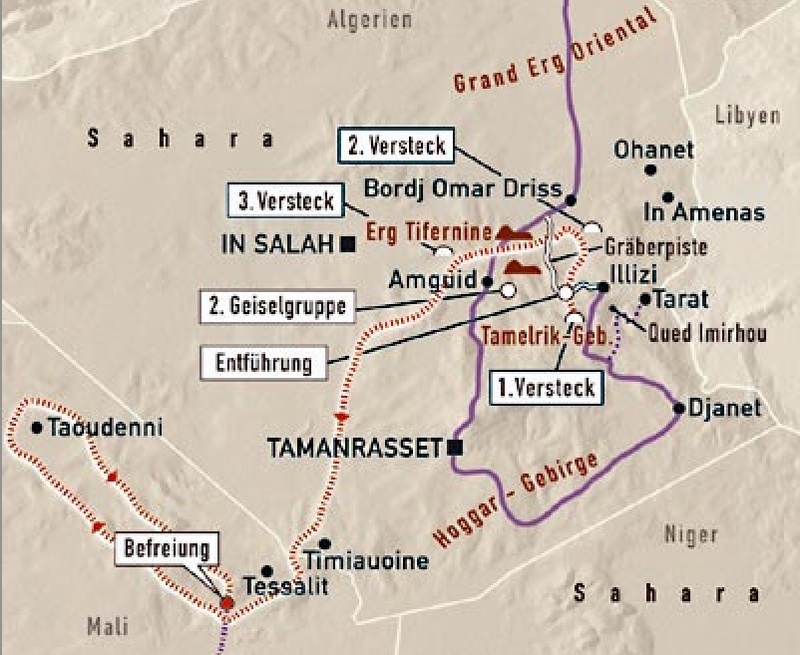 In addition, the Algerian military ignored the Tuareg messages in Tamelrik Mountains camps would create. And despite great gratitude that there later everything possible was done for us – the Federal Foreign Office travel warning for southern Algeria was definitely too late. The Sahara Club had already on 19 3 03 pointed out some missing. This entry was posted in Desert Babbles (blog), Sahara A to Z... and tagged 2003 sahara kidnappings, Rainer Bracht, Sahara kidnapping on May 19, 2015 by Chris S.